One of the easiest and most inexpensive ways to bring the comforts and beauty of the indoors to your outdoor living spaces is to mount a weatherproof, decorative Outdoor Clock or Thermometer to the wall of your sun room, patio, deck, or balcony. Today's Outdoor Clocks and Thermometers are constructed of weather resistant materials like heavy resins, metals, and woods, and they come in every imaginable style and color -- you are sure to find the Outdoor Clock or Thermometer that fits your existing decor and your unique personal style. Outdoor Clocks are stylish and beautiful enough to use inside as well. A decorative clock provides a lovely focal point above a fireplace mantle or above a favorite piece of furniture in the living room or family room. A wall clock can also add functional beauty to any kitchen or office space. There are infinite possibilities inside and out. 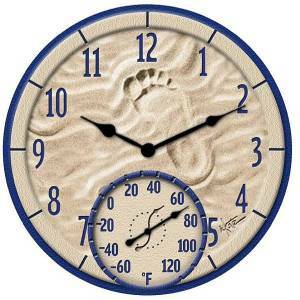 At BackyardCity.com, you will find a variety of weather resistant clocks that can be used indoors or outside, including oversized clocks, metal clocks, and even radio controlled atomic clocks. We offer clocks in a wide range of styles as well, including antique, traditional, contemporary, and rustic. Functional as well as decorative, these clocks are designed to withstand the elements. Use them by the patio or pool, on the deck, or anywhere you want the convenience of a clock or thermometer. 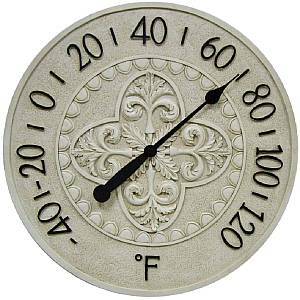 Read more about Outdoor Clocks and Thermometers in this helpful and informative article. Please click on the clock you are interested in for additional details.